Sealed silos: why make the switch? Home > Sealed silos: why make the switch? Silos are the grain storage solution of choice for many of us; however in recent times there has been a particular emphasis on ensuring they are sealed. 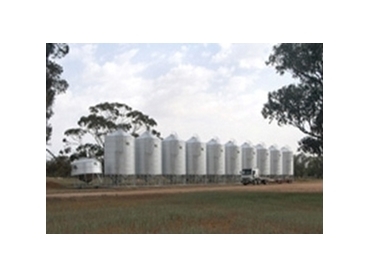 In fact, Australia now has a national standard for such silos, known as AS2628. The push for such a standard is in part thanks to the efforts of the Grains Research and Development Corporation (GRDC), a government body that operates for the benefit of Australia’s grains industry. Both the GRDC and grain storage specialists such as Peter Botta advise that those looking to purchase new silos opt for sealed varieties. So what is all the fuss about? Why are sealed silos favoured over their non-sealed counterparts? Speaking to industry publication The Stock Journal, Botta notes there are multifarious reasons, including the fact that sealed silos boast the ability to store grain for longer periods, whilst still maintaining their original quality and freshness. The effectiveness of insect fumigation is also dramatically increased when conducted within sealed silos, because gases are less likely to escape. “When using fumigation gases, the area being fumigated must be able to hold a concentration of gas for a length of time. In unsealed structures these requirements are not met, even if the dose rate is increased,” explains Botta. When the fumigation process is conducted in unsealed silos adult insects may be killed, however because the gases can escape at a much faster rate, it is more likely that insect eggs will survive. These eggs will eventually grow into adults and cause considerable damage to grain, which will inevitably make it unfit for either livestock or sale. HE Silos manufactures a wide range of sealed silos that are constructed using Henrob and Huckbolt fasteners, and no pop rivets are used. This ensures an airtight seal, and means that the silos not only meet, but exceed the recently introduced AS2628 silo sealing standard. The silos subsequently allow for the controlled fumigation of insects, using either phosphine or carbon dioxide. Botta stresses the importance of pressure testing silos both prior to each use and once they have been filled with grain to ensure they are sealed, as they can contract and expand when filled with varying quantities of grain. The company's silos are equipped with a pressure relief valve that operates to prevent pressure build up and helps to ensure they remain sealed, even when substantial amounts of grain are stored therein. He also recommends that silos are fitted with an aeration fan, and these are available as an optional extra with a range of silo models.